Windows can help save energy. Knowing which are the best energy efficient windows for your property is a useful part of green living and environmentally friendly housing. Windows have the potential of being one of the least energy efficient features of a home. If someone told you they were thinking about knocking great holes in an otherwise warm and cozy house, then filling these holes with flimsy clear glass and often ill-fitting wood you would think they were crazy! But each window in a house, if it is old, damaged or ill maintained can let precious warm air (or air-conditioned cool air) out and let drafts in at an alarming rate. Just stand in front of a window with an ill-fitting frame on a cold day and you will feel the cold air seeping in. Windows are vitally important to a house, however. Windows bring in daylight, offer a pleasant outlook onto the world outside and can bring fresh and clean air into the living environment. So the green solution is not to brick up all windows, but to look for energy efficient alternatives. An energy efficient window is one that helps to maintain a constant atmosphere in a room, thus saving on the energy needed to heat or cool the room. For a start, the energy efficiency of any window can be improved by insuring that it is well maintained and doesn't have gaps in the frame that can cause drafts. This is fine for existing windows, however when fitting new windows there are many more options and factors to consider. The frames are an important part of any window and the way the frame is manufactured and the material that it is manufactured from is essential to its energy efficiency. Plain clear glass can be inefficient as the glass lets in light and generates heat. There are coatings available that can enhance the insulation properties of glass yet not be detrimental to the visual quality of the glass. Multiple panes of glass, which is known as double or triple glazing, trap air between the panes that adds to the insulation qualities. Multiple panes also offer better sound proofing which can be useful in urban environments. 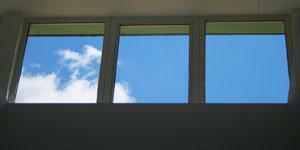 Some windows have a gas that is injected between the panes. This gas offers better insulation qualities than air and can provide greater energy efficiency. One of the ways that the energy efficiency of windows is measured is a calculation called the U factor (or U value). Most modern window units will detail their U factor and the lower the U factor, the better insulation the window provides. For more information about how the U factor is calculated, take a look at the Building Energy Codes Resource Center website. nrfc.org - a useful fact sheet in pdf format provides information about measuring the efficiencies of windows. The Energy Star initiative is a development between The Department of Energy (DOE) and the Environmental Protection Agency (EPA) to create a series of standards that will help the consumer to better understand the energy efficiencies of mainstream household items. This includes items such as windows and doors. Energy Star products have to be manufactured by companies that meet stringent standards. This gives consumers the reassurance as to the quality of the products they are purchasing and also clearly identifies the energy savings that they are making. For more information about Energy Star windows, take a look at the excellent Energy Star website. It is exciting to note that in some areas grants and subsidies are provided to help in the replacement of windows. For instance, Federal Tax Credits of up to $500 can be earned through the replacement of windows. Energy efficient windows are one of the many ways of helping the environment. However, as they can also save on fuel bills, then they are an attractive proposition all around!